Why Making Healthful Foods Cheaper Isn't Enough Researchers set up an experiment to see how prices influence what kinds of food moms buy. They found that lowering the prices on fruits and vegetables did lead to moms buying more. But it didn't stop them from buying junk food, too. Bucks for broccoli or cash for carrots? Financial incentives aimed at encouraging healthier choices are catching on from New Zealand to the Philippines. Workplaces in the United States have been offering incentives for weight loss. In a London-based study, dieters got paid when they dropped pounds. 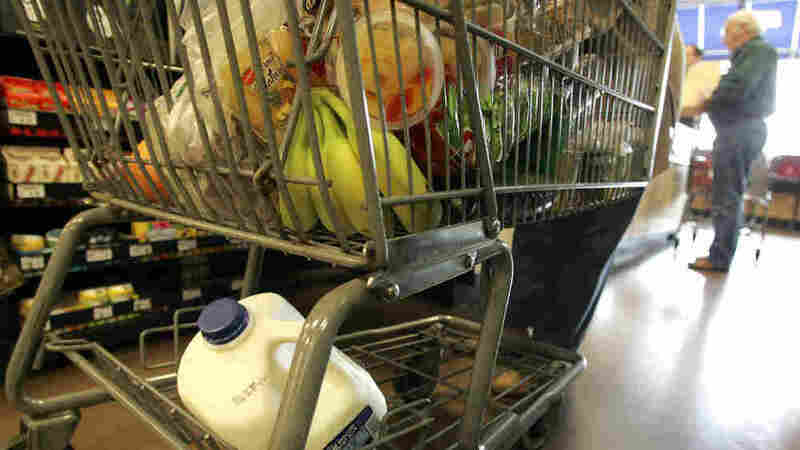 Now researchers are interested in understanding how food price manipulations may influence what ends up in mothers' grocery carts. Does increasing the cost of sugary items mean fewer people buy them? Would more people buy veggies if they were more affordable? To find out how prices influence choices, researchers at the University of Buffalo set up an experiment where they could control food prices and see how shoppers responded. For their study, they recruited a bunch of moms to shop for groceries in the simulated supermarket and gave them each the same amount of money. In the first shopping trip, the food prices were identical to what was being offered at the local grocery chain. But then the researchers manipulated prices several different ways. First they discounted the prices of healthful foods — making items such fruits and vegetables much cheaper. They tried a 12.5-percent discount, then a 25-percent discount. "Then we looked at the purchasing patterns of these mothers," explains Len Epstein, a professor of pediatrics at the University of Buffalo who was involved in the study. He says the mothers' choices were somewhat predictable. When the costs went down, "they did buy more of the healthy foods." But since the healthful items now cost a lot less, the moms had money leftover. Esptein says they used it to buy more junk food. "When you put it all together, their shopping baskets didn't have improved nutrition," says Epstein — they had the same amounts of fats and carbohydrates. If subsidizing healthful foods leads to the unintended consequence of people spending more on junk, might there be another way to structure incentives? The researchers tried a different price manipulation: They basically placed a hefty tax on high-calorie, low-nutrient foods. They found that that moms stopped buying so much junk. The researchers say their findings suggest that the taxes were more effective than subsidies. This conclusion doesn't surprise Karlan. He sites the theory of loss aversion: "People are just more responsive to price increases than decreases." Karlan says a "sin tax" — charging more for unhealthful foods — would not change families' diets or approach to nutrition overnight. But it could serve as a first step in raising awareness of bad habits, alerting us to the kinds of things we choose to snack on. All kids love a treat. And the students at the Argenziano School in Somerville, Mass., are no exception. Some of their favorites? "Skittles" calls out one seventh-grader. "Doritos," says student Marcos Azerbido. "I used to bring Doritos every day." But not anymore. These days, fresh fruit is the only choice for their mid-morning snack. On their way out the door for recess the kids reach into bins filled with apples and bananas and other fruits depending on the season. The fruit is funded through a USDA grant, and free to the students. "Once they get it every day, they'll eat like three bananas," says teacher Sharyn Lamer, who has tried for years to enforce a healthful snack rule in her classroom. She says when parents were sending their kids to school with chips or sugary treats it was tough. "But now it's the rule in the entire school. And the kids are into it," says Lamer. "It's not me being the mean teacher who's not letting them have their Doritos!" As habits change it school, Lamer says the students may think differently about their choices at home.